Kennards House Methodist Chapel | Launceston Then! A Bible Christian society was formed at Kennards House as early as 1831 becoming part of the original Week St. Mary circuit. Ten years later it was transferred to the newly founded Launceston Bible Christian circuit. 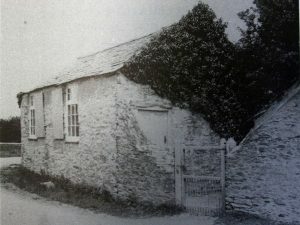 From 1849 worship was in a building previously used for other purposes and adjoining the where the road from South Petherwin at that time joined the Launceston to Bodmin main road. For the next 32 years this building sufficed for the purpose but through time the premises became dilapidated and no longer fit for purpose, so in 1881 it was decided to build a new chapel. 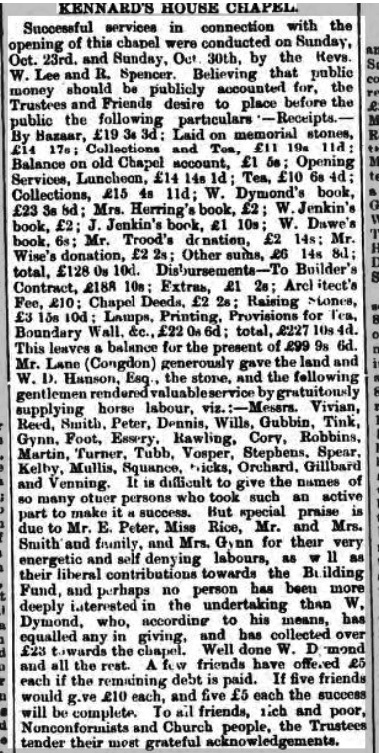 Mr. Lane of Trecongdon, gave a parcel of land on the adjacent corner, and a building fund was commenced with a festive occasion at nearby Newlands Farm on January 6th, 1881. Hosted by the Smith family, the public tea, Christmas tree and bazaar was attended by over 150 people raising the total sum of £19: 18: 9d. Memoral stones were laid on May 12th, when a further festive day raised £26: 16 : 11d. Building proceeded apace, and by October the chapel was completed and the building was officially opened on the 20th of that month. Many names are recorded as contributing to the building operation, notably Mr. W. D. Hanson who gave the stone, Mr. W. Dymond who raised the highest total of money, Mr. E. Peter, Miss Rice, Mrs. Gynn, Mr. and Mrs. Smith, the Jenkin family, and others. Those who ‘rendered valuable service by gratuitously supplying horse labour’ were Messrs. Vivian, Reed, Smith, Peter, Dennis, Wills, Gubbin, Tink, Gynn, Foot, Essery, Rawling, Cory, Robbins, Martin, Turner, Tubb, Vosper, Stephens, Spear, Kelly, Mullis, Squance, Hicks, Orchard, Gillbard and Venning. The events of the opening day included three preaching sessions, at 11 a.m., 3 p.m. and 7 p.m., intersperced with a luncheon and tea, again at Newlands Farm. Sermons and addresses were delivered by Rev. R. J. Dymond (Chairman of the District), T. Wenn (Wesleyan), J. Bamford (Congregational), J. Stafford (United Methodist), R. Spencer and J. Stephens. The weather was described as ‘boisterous’, but this did not detract from the success of the occasion which was ‘supported by Nonconformists and Church people alike. The inauguration of the new Chapel continued with special services on the following two Sundays, when the preachers were Rev. W. Lee and Rev. R. Spencer. With the site, stone and some labour given, the contract price for the building was £188: 12: 0d. Extras such as lamps. boundary wall, etc., brought the total outlay to £277: 10: 4d. The contractors were Messrs. Lintern and Rich, of Lifton. The architect was Mr. C. P. Wise, of Launceston: fee £10. By the end of the opening celebrations, 60 per cent of the cost had been raised. Changes in the title of the Chapel came about through the Methodist unions of 1907 (United Methodist Church) and 1932 (Methodist Church). Following damage by a military vehicle, the original chapel was demolished in 1957. 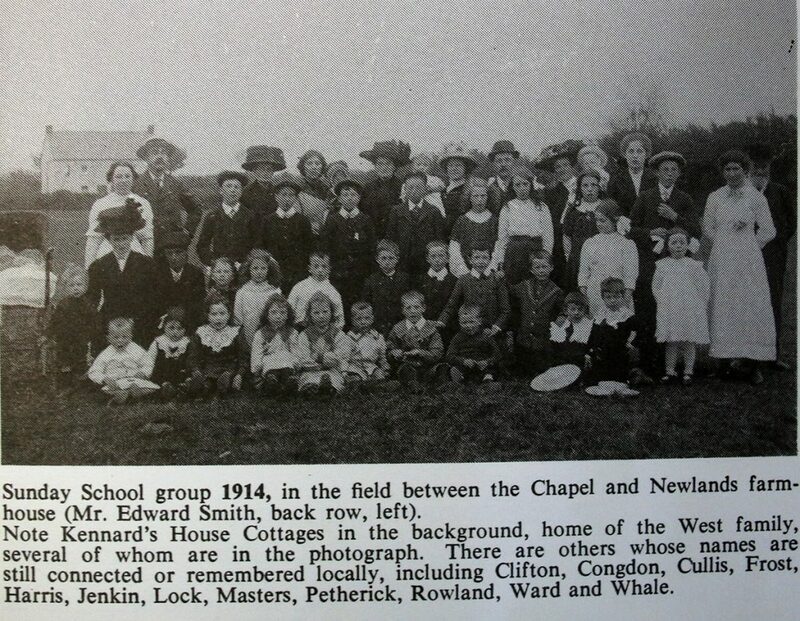 The site was then purchased by Cornwall County Council for £550, as part of a road widening scheme, and the adjoininh garage was reconstructed to provide a new Sunday School. Messrs. Phillpotts carried out the work at a cost of £588, and Mr. W. L. Whale, of Penfoot, generously gave land alongside to provide a car park. Electric light was connected to the premises four years later in 1961, calor gas having been installed by Mr. Kinsman in 1952, after oil lamps had served for seventy years. 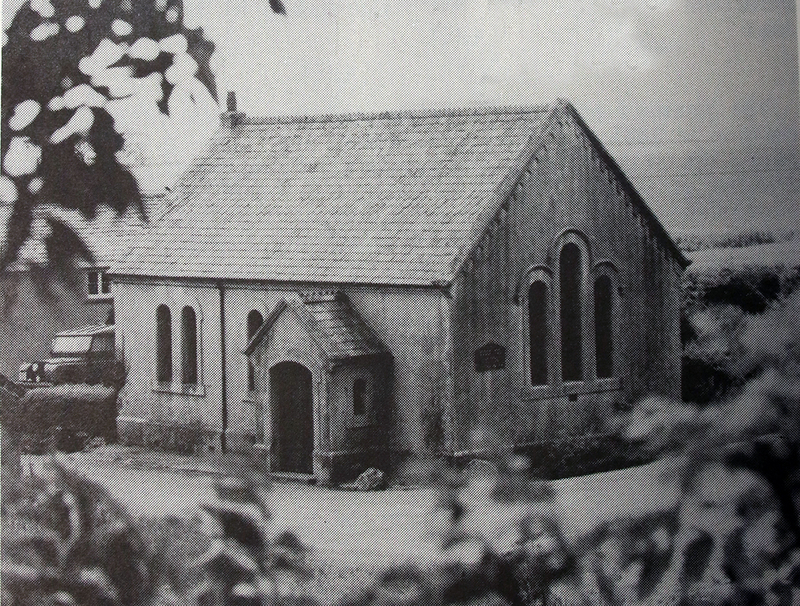 The vulnerable location of the premises at what had become a very busy road junction, was transformed in 1972 by the construction of a new dual carriageway to the east, involving closure of that part of the road to South Petherwin which hitherto passed between the chapel and Sunday School. The road was further changed in 1989 with the construction of the A30 dual carriageway. In 1981 the Chapel celebrated its centenary with a Thanksgiving service on Thursday, October 22nd which included a celebration concert with the Loveny Male Voice Choir. This was followed on Sunday, October 25th with centenary services in the morning and evening. 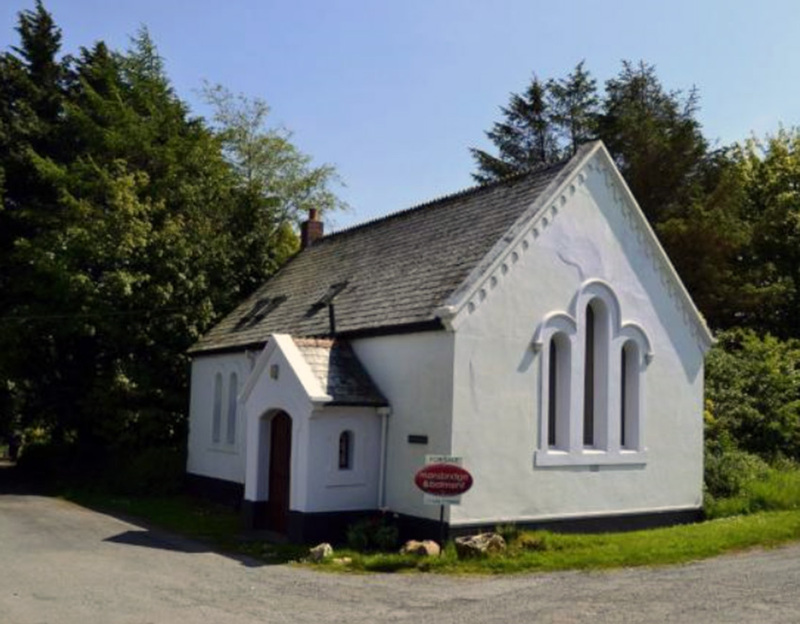 By the end of the 1980’s though, the Chapel congregation had deminished to a level that was not sustainable and the decision was made to close the Chapel and sell the property which was subsequently converted into a private dwelling.